Bert and Ernie were two popular names pre-1970. Sesame Street and The Muppet Show brought ‘bachelors’ Bert and Ernie together and they became a part of popular culture in the lives of children and adults throughout the 1970 and 1980s. Bert Newton and Ernie Sigley were two of Australia’s premier comperes, entertainers in the 1970s. They were also huge footy fans with Bert following the Roys and Ernie a devout Footscray fan. Below is Sigley butchering Sinatra’s classic, ‘My Way’. Adelaide, Brisbane, Fremantle, Gold Coast, GWS, Port and West Coast have not had a Bert or Ernie represent them in the VFL/AFL. Trivia Question: Who was the last Bert or Ernie to play in the VFL/AFL? Almanackers, here is your chance to nominate your favourite Berts and Ernies from Australian Football. Nominations outside the VFL/AFL always welcome and encouraged. One famous Bert you missed was the man who got dragged in the 1970 grand final to allow a little bloke called Ted Hopkins on the ground and the rest, as they say, is history …. Bert Thornley, although he was a Gilbert as distinct from an Albert. Bert Johnson later played with Williamstown and was in a bad car accident on Footscray Road near the old wholesale fruit & veg market after training just before the 1969 grand final along with captain-coach Max Papley and gun full-forward Dallas Patterson. Papley & Patterson both played and Williamstown won, Papley kicking three goals & Patterson, who played with a face guard,one. Favorite snack for the team would have to be Bertie Beetles. Anyone in this team would have to earn his place.Perhaps the team could borrow Lord Bertie Lissie from Biggles’ team. I’m sure Captain W E Johns wouldn’t mind. And they called him ERNIE and he drive the fastest milk cart in the west. That Ernie or Bert the chimney sweep from Mary Poppins could vie for team mascot. Ernie Wenske (well known to lots of SA football followers – CARN THE PECKS!) could be No1 supporter. #1 Ticket Holder – Ernie Dingo (West Coast Eagles 95/96). Closest I could get. Love the wordplay Fish. Robert Dipierdomenico was often called ‘Bertie’ before he became ‘Dipper’. Rabid – Nice nom from SA. Any famous South Australian Berts ? PB – Ernie Dingo was considered for entertainment, but Sigley … geez, what would have Sinatra thought watching that performance? Bert Bacharach perhaps. You being a lover of Golf, Ernie Els or ‘Eeels’ as a tipsy Steve Bracks once referred to him. 6% – Playing the Bert or Ernie side of the ground. That would be funny. I have a challenge for you: how about a team of players with christian names we’ve only seen once …. Sav Rocca springs to mind as an opener. 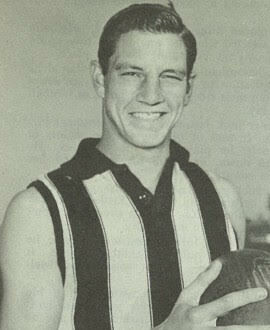 Bertie Johnson was a West Adelaide premiership player in 1961. Ernie Sigley’s brother in law was prominent Adelaide Advertiser photographer Barry O’Brien (who Fisho would also know as coach of Central Districts Baseball Club for many years). Ernie Merrick could add some heft to the coaching stocks. PB probably regrets following a few of Bert Day’s specials. Former Middlesex ‘keeper Ernie Clifton was SACA’s coach during 70s and had a lot to do with Salisbury DCC in its early days. John Bertram (he of winged keel fame) could sail around the oval whilst Bert Hinkler could fly over it. Half time entertainment could come from Burlington Bertie. Swish – West Adelaide’s indigenous Bertie Johnson that you mention is the same person that Phil named in the forward pocket as Bert Johnson (North Melbourne). He played 87 games for Westies and 31 for North over 12 seasons from 1957-68. Not sure why he played so few games. He was a brilliant if spasmodic/mercurial player under Neil Kerley at the Blood and Tars. Injury, suspension, form??? No doubt he copped enormous abuse and “attention” as a brilliant, indigenous player in an era where there were few in SA. Only Roger Rigney and David Kantilla come to mind. Rulebook – thanks for the family shout out. “Uncle” Bert was a source of wonderment as a kid. We were of modest means with a great grandfather who was a train driver from Mile End on the wrong side of the tracks. The Baulderstone Construction name adorned every building site in Adelaide growing up (and still does). The only explanation I ever got was “second cousins twice removed”. An anonymous family member booked a lunch table at the Redlegs Club 20+ years ago. Went to the counter to pay at the end of the meal and was greeted with “put it on the company account Mr Baulderstone?” Nodded and didn’t go back. The ruggedly handsome Ernie Toshack played 12 Tests post WW2 under Bradman as an accurate backup left arm medium pacer (a la Underwood) to Lindwall and Miller. Dubbed the Black Prince because of his good looks. Bert “Dainty” Ironmonger was a left arm finger spinner and 45 years old (fourth oldest) when he debuted for Australian in 1928. Took 74 wickets in 14 Tests with a best of 7/23 in the era of uncovered pitches (he was unplayable on a ‘sticky’). Yes PB, I knew that it was the same bloke. I’ve found this, which might help explain his low game tally. PB you should have been a Norwood man could have had a hell of a lot of free lunches ! I continue to be amazed at how you keep coming up with these. Swish – Didn’t know of the Sigley Adelaide connection. Bouncin’ Bertie Johnson could have been anything by the looks of it. Great pic and article. PB – Paul Kelly’s ‘Bradman’ makes the hair stand when I play it. “When Bert Oldfield hit the ground…” What a wonderful song. Toshack, Dainty Ironmonger. Great names. Uncle Bert Baulderstone sounds like a generous fella. As Book asks: How could you not be swayed by Norwood? Book – I can’t believe I forgot Ernie Smith. Major oversight on my part ! Cheers Smokie. Glad you enjoy the teams and appreciate your positive comments. Hi Wally – My mistake. He wore number 2 in those 15 games. Got my stats columns mixed up there. Apologies. Ernie Hug had a tragic end when a tree fell on him whilst working on his farm. I recall, though this may be an urban myth, Ernie Hug used to arrive at training in a Rolls Royce. True or false? Phil, I didn’t figure on there being any Cornelius’s who’d played AFL? The one in ‘Planet Of The Apes’ rivals Dr Zaius as one of the more successful RNG (random name generator) approaches in cinema. Thrilled to hear that unique names has been on your radar. I’ll keep my eyes peeled for a piece around the corner. And hope Cornelius, whoever he or she was, is good enough to make the team. But not at the expense of Val Perovic. Further on Val getting a guernsey at the expense of Cornelius, that goes for Ilija Grgic too! Zitter – Cornelius ‘Con’ McCarthy, a Collingwood captain who also played 30 games for Footscray as Caprtain-Coach in 1925-26 ! Haven’t found a Zaius or a Galen, yet. Sharrod and Marley on either side of Val at CHB. Gaining momentum. PB – my late dad had a pair of batting gloves that belonged to Berie Ironmonger, how he came to get them I’m uncertain. Every so often when cricket was being discussed he’d bring them out to show everyone and tell stories of Bertie’s exploits on and off the field. I now wish I’d paid more attention to these stories as a kid. Whatever happened to the gloves I’ve no idea. Any chance of a Clarrie or a Horrie getting a berth ? PB – I got it wrong! Dad had Ivor Fleetwood-Smith’s batting gloves not Ironmonger’s as I thought. Ernie Jones (Australia). 64 wickets in 19 Tests, Australia’s leading fast bowler in the late 1890’s and early 1900’s. Ernie McCormick (Australia) 36 wickets in 12 Tests prior to WW2. Bert Sutcliffe (New Zealand) 42 Tests, 2727 runs at 40.10. The first great Kiwi batsman. Bert Vogler (South Africa) 64 wickets in 15 Tests. One of the first bowlers to regularly use the googly in Test cricket. Col – Yes,a great thread. Love how these teams trigger so many vivid memories. Glen ! Not sure that there enough quality Horries and Clarries to make a proper, positional team. Luke – Cheers mate. Always appreciate your cricket connections to the old names. Vogler must have been a talent. Bert Sutcliffe definitely a Kiwi pioneer. In addition to Rulebook’s Redlegs contribution, the most prolific Bert or Ernie at Norwood was Bert Schumacher who played 104 games as a rover between 1920 and 1927. It would appear most Ernests at the club went for Ern or something entirely different. Most interesting and best name, perhaps, is Ethelbert ‘Bert’ Luxmore Renfrey who played football in SA, WA, NSW and Victoria (St Kilda) at the start of the 20th century. Apologies, Fisho, so you did. Dave – Ethelbert is a brilliant name. Great get ! Smokie – Benny Hill’s Ernie a cracker.